The following is mainly summarized from Friedrich (2000) . The eruptive events from 197 BC-726 are only poorly documented from Greek, Roman and Byzantine writers. Citations can be found in the excellent book "Fire in the see" (Friedrich, 2000). 197 BC -- Formation of an island called Hiera (gr., = "the holy one") inside the caldera, probably a precursor of Palea Kameni. Documented by greek and Roman writers: Strabo (66BC - 24 AD), Plutarch (ca. 40-120 AD), Pausanias (ca.120 AD), Justinus (2nd century AD), Eusebius from Cesarea (270-340 AD) and Ammianus Marcellinus (ca. 330-400 AD). Probably surtseyan activity with updoming of the sea-floor (comparable with the 1707-1711 events). 46 AD -- Appearance of a new island that probably grew together with Hiera and formed the basis of Palea Kameni. Descriptions by Roman historians Seneca (4 BC-65 AD), Livy (59 BC-AD 17), Pliny the Elder (23-79 AD), Dio Cassius (ca. 200 AD), Aurelius Victor (4th century AD), Philostratos (ca. 200 AD), Orosius (5th century AD), Cassiodorus. (418-562 AD), Labbreus (1670). Probably surtseyan activity with updoming of the sea-floor. 46-726 AD -- No reports of activity are known from that period. There was either actually no eruption or it has not been recorded. 726 AD -- Strong explosive probably sub-plinian eruption. Records by Nicephoros (758-823), Theophanes (752-818) and Cedremus (after 1059). Probably small effusive activity following the pumice eruption creating the black blocky lava lobe at Agios Nikolaos (the small harbor bay with the church and hot iron springs). 1457-1458 -- Unclear reports from Athanasius Kircher (1665) and Buondelmonte (1465/66) indicate that either a part of Palea Kameni collapsed and disappeared or a new island between Palea Kameni and Thera was built. 23. May 1707 - Sept. 1711 -- Formation of Nea Kameni (gr., = "the new burnt island"). Strong surtseyan and effusive activity. Ash-fall and gas explosions. Lowering of the coastline of Thera and Mikri Kameni. - 23. May 1707 at sunrise -- Rising of a white island ca. 200 m west of Mikri Kameni. Updoming of the sea-floor. White pumice and black lava blocks covered with living sea animals. - 23. May - 13/14. June 1707 -- Rising of the white island without visible volcanic action up to 70-80 m height and ca. 500-600 width. - 5. June 1707 -- Rising and growing of a black island north of the white island. "Fire" visible (lava fountains?). - 12. June 1707 -- The white and the black island unite. 1711 - 1866 -- No activity. 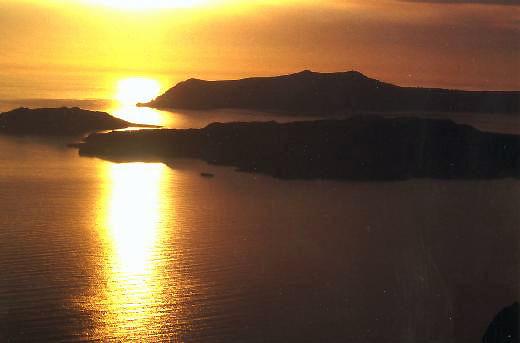 Mikri and Nea Kameni separated islands forming 2 natural bays (Georgios and Vulkano bay). Sulfuric fumaroles in Vulkano bay. Building of a small harbor and ca. 50 summerhouses (!) on Nea Kameni. 4. Feb. 1866 - 15. Oct. 1870 -- Moderate effusive and minor explosive activity. Mikri and Nea Kameni unite. Lava flows, lava fountains and ash-falls. - 26. Jan. 1866 -- Falling down of blocks between Mikri and Nea Kameni, fractures in the walls of houses. - Following days --Rising temperature of seawater (boiling) and increased fumarolic activity. - Beginning Feb. 1866 -- Smoke and rising of dark cooled lava blocks to the surface of Vulkano bay. The rising cone was called "Georgios". - 6. Feb. 1866 -- Cooled lava blocks reach Nea Kameni and cover the houses. - 20. Feb. 1866 -- Strong explosion of Georgios. Ash-fall. Repeated in short intervals during the following months. Max. height of pyroclastic columns during paroxysmal explosions 2,2 km. - New eruptive center, called "Aphroessa", becomes active south of Nea Kameni. - March 1866 -- Products of Aphroessa reach Nea Kameni. - 10. May 1866 -- New eruptive center. Formation of a small island ("Maionisi", gr., = May-islands) that dissappears shortly after. - Aug. 1925 -- Rising temperature in the Red bay ("Kokkina Nera", gr. 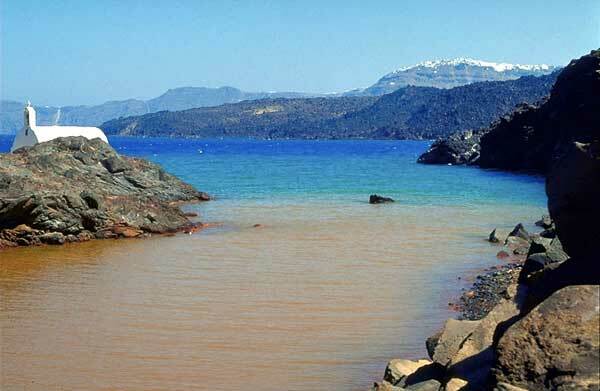 = red waters) at the eastern shore of Nea Kameni and subsidence of Nea Kameni's east shore. Vapor fountains and lava outflow. - 11. Aug. 1925 - Jan. 1926 -- Building of a small cone ("Daphne"). Effusive and explosive activity from this cone culminating in paroxysmal pyroclastic columns up to 3,2 km high. - Jan. 1926 - May 1926 -- Pause of activity. - May 1926 -- Phreatomagmatic explosions producing minor pyroclastic flows. - May 1926 - Jan. 1928 -- Pause of activity. - Jan. 1928 -- 4 phreatic explosions and mixed effusive-explosive activity forming a new lava dome called "Nautilus". 20. Aug. 1939 - July 1941 -- Formation of several lava domes ("Tritona", "Ktenas", "Fouqu�", "Smith-Reck" and "Niki"). Extrusive and slighly explosive activity. Lava outflow in most cases preceeded by phreatic explosions. 10. Jan. 1950 - 2. Feb. 1950 -- Small effusive activity ("Liatsikas" lavas) preceeded by phreatic explosions.